Upholstered in glamorous faux leather, this platform bed from Strick & Bolton will enhance your bedroom decor. Constructed from durable wood and metal, this set includes the rails and slats and is cushioned with plush foam to keep you comfortable. Detailed button tufting accents the padded headboard for a classic finish. Please note: orders of 125-pounds or more will be shipped via Freight carrier and our Oversized Item Delivery/Return policy will apply. Please click here for more information. This bed is very appealing to the eye. Everyone that has seen it like the way it looks and they way it makes my room look. It was easy to put together all by myself (I am 5'5" and a female.) Took a little over an hour alone. I am a little worried about getting the bed dirty but for the price and the warranty am comfortable with this purchase. Would recommend. The bed arrived much sooner than they anticipated and that was great! The assembly was easy with two people and only took an hour. The wood supports are very comfortable under the mattress and much better than a hard platform. The beauty of the bed is as nice as the photo. a very nice and comfortable bed. I am so glad I got this bed! Stunning bed! Ordered it in Queen size for my daughter. The assembly was easy and pretty fast. It is pure white color, and good quality. Now will be looking for matching dresser and night stands. Had this for over a 1 year and I noticed the side of the bed was bulging out. Didn't think to much of it cause I thought it was just the foam. After a few more must months I noticed the same thing was happening to right side. When I touch the part that bulging I notice that it is not the foam but the plywood. I could hear the wood making a popping noise.Which even upset me even more . I am a very clean person. So I know this couldn't happen for wear and tear. It's because the bed is poorly made. If I had the chance of buying this bed over. I wouldn't. This bed is flat-out GORGEOUS! It was everything I wanted in my white, headboard tufted bed. Only downside was, a few months after purchasing, the middle stub that held up the planks broke. My boyfriend bought a new piece of wood from Home Depot and replaced it and it's been more than perfect since then. For the price, you won't find better. I recommend this product!! I purchased the queen size bed for my daughter's room. I was concern that the bed may be bigger for the room size as she had a twin bed before, I was pleased that the bed made the room seem bigger. I purchased a 13" mattress that goes perfectly with it. It looks better in person than online. It was easy to put it together, however, you would need two people to do the job. Very excited about the purchase. Although it took a bit of extra time to be delivered and to build, this bed is amazing. it made my mattress which was a bit too soft much more sturdy which helps my back a ton. my bedroom is decorated gray, white and turquoise and it fits beyond perfect. Looks beautiful in my daughter's bedroom, easy to put together. Footboard came damaged but Overstock had another shipped super fast. Beautiful bed! It easily made way for the nautical theme in our bedroom. The bed is the perfect height and didn't make you feel like you had to hop up to get on the bed. The bed had ample slats so even for "sizable" people the bed stood up to the tests. Nice looking bed. Well made. My favorite bed. It’s a pretty good quality and well made! The bed arrived right on time, it looks picture perfect. Assembly took about 2 hours but it was easy since instructions were very detailed. Looks great with our pink walls. The good thing was it didn't require a bed foundation, which was one of the reasons why we chose it. So far so good. Ok for the price and easy to assemble. I have enjoyed this bed for all the time I have had it. I have received compliments on its style and look. I really like how the headboard looks against my sheets and pillows especially when I dress my bed up for the different seasons. have had the bed for a couple of years, my daughter seems to be pleased with it. it provides good support for the mattress. the only problem is that it is hard to clean under. "is the headborad all the way to the bottom of the bed ? or is there is a gap"
"Is there any storage place under this bed?" Hello OstkUser78920, this bed does not feature any space to store anything underneath. Thanks for shopping with us! "Hello, What size memory foam mattress do you recommend for this bed?" Hello nikkit, thank you for your question. I think any 11-14 inch mattress would work great. 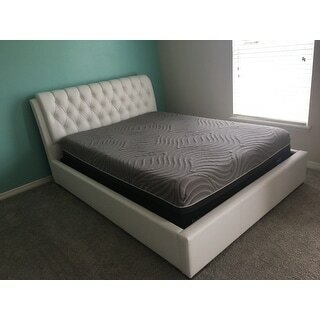 We have many different memory foam choices to choose from for really great prices http://www.overstock.com/Home-Garden/Mattresses/Memory-Foam,Queen,/mattress-type,size,/2019/subcat.html If you have any other questions please let us know. Have a great day! Is the base wood slats or a solid wood platform on which to put the mattress? "Description doesn't say headboard. Does the price include headboard? Also, are the bed legs made of metal?" Hello Trinath P., this purchase includes the headboard, footboard (including the feet) as well as the side rails and slats to support the mattress. Thanks for shopping with us! "What are the dimensions of this bed??" Hello crissap, the queen size bed is approximately 66 inches wide x 92.7 inches deep x 43 inches high. The headboard is approximately 43.3 inches high. The footboard is approximately 13.7 inches high. The internal side is approximately 61 inches wide x 81.5 inches deep. Thank you for shopping with us! "Can I use a low profile box spring with this bed?" Hello sdolan11, this item does not require a box spring. You are welcome to use a low profile box spring however, it will add height to the mattress and cover more of the headboard. Thanks for shopping with us! "Are the bed rails and footboard also faux leather or just the headboard?" Hello ceason07, the faux leather covers the headboard and frame as well. Thank you for shopping with us.